← Are we really surprised? Terrorism in France: We’ve seen it again and again, most recently in January of 2015 when Charlie Hebdo was attacked in Paris, and November of 2015 when when three sites in Paris were attacked. And now the Islamist War on the West (and France in particular) comes to the Mediterranean Coast and Nice. And once again, it is clear that nobody in government or the public has learned a single thing. 84 dead, 18 fighting for their lives (maybe) in hospital, after a “loner” drove a truck through Bastille Day crowds on the waterfront. Compare the two pictures, of some of the crowd fleeing, hands high in the air as they apparently try to surrender to a madman who is not asking for surrender, just driving wildly to swerve and kill more, including the 10 children already dead. Now we see Simone Segouin, a typical French teenager in miniskirt (just like the girl in the last picture, no?) 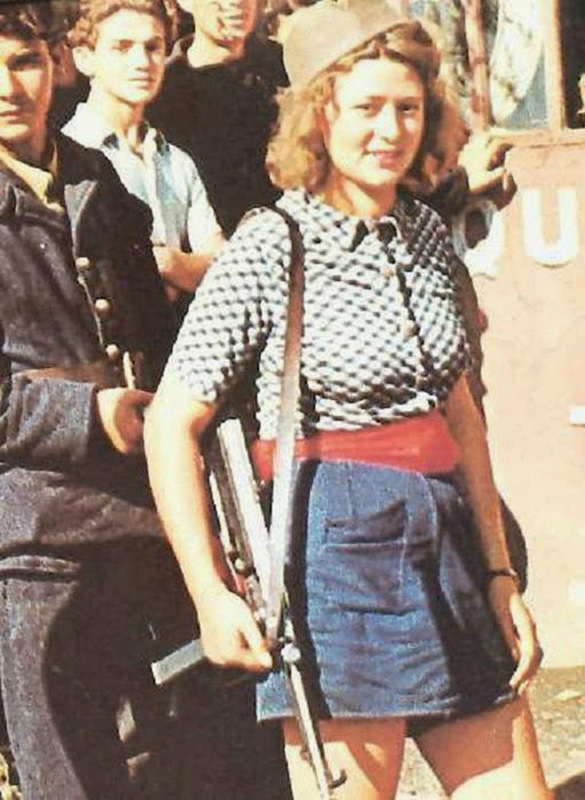 in Paris in 1944, after she helped drive German occupation troops out of the city as part of a group of partisans fighting to restore French liberty. Can the contrast be more stark? 150 years of war, triggered in very large part by the stupidity of the French political and military leaders, allowed to be stupid by the people of France, have destroyed the French nation. For 70 years we have joked about how easy it is for French to surrender. Their track record is sick as a nation. Franco-Prussian War in 1870 = surrender to Prussia (and the new German Empire). The Battle of France in 1940 = surrender to Hitler. Indochina in 1954 = surrender to Communists (Vietnamese Communists, not French Communists). Algeria in 1960 = surrender to Muslim terrorists (excuse me, “freedom fighters”). Even one or two people, armed with something as puny as a .22-caliber revolver, could have prevented most if not all of these deaths and the hundreds of injuries, by forcing the murderer to do something else. Instead, all the French crowd (and lots of Americans and Brits, I point out) could do is run. And where were the police? When seconds count, they were minutes away. The news spin is already treading its usual path of “lone wolf” and “upset over losing his job and his family” and “no known ties to Islamic terrorists.” Yeah, as if French intelligence (any more than American intel) could tell you within months whether or not he had ties, what his “religious” views were (was he a faithful Muslim follower of Mohammad (peanut butter und honig), or an apostate that believes that line about a “religion of peace,” and who he knew and hated. Because he supposedly had guns (a rifle and pistol – how on earth in France???? Aren’t those against the law? Isn’t the law protecting people) and a whole batch of (current report) fake guns and grenades in his rented truck, we will hear that squatter in DC calling for more gun control. And no doubt more hoops to jump through to rent a truck. But NOTHING about what would really stop things like this from happening. I wonder if he bought the damage waiver when he rented the truck? Wonder if the rental company’s insurance will cover the total loss of the truck or will it use a “war exclusion” to deny a payout? The news this morning claims the killer shot at the police and then they returned fire. But the video of the shooting and the photos of the truck don’t show any firing from him or any bullet-holes that I can see. Odd, eh? Convenient that he was killed by the police, so that we don’t have a chance to find out what HE claims were his motives. But then, we don’t get to question suicide bombers, either. Mama’s Note: I don’t see any particular benefit in knowing their motives. Most people have more than one motive for doing things, especially those who resort to violence. And most people don’t really know or understand all of their motives for anything! The important thing in these attacks is the action, and the response of both bystanders and the intended victims. Seems to me that the only “motives” that are relevant are those of the powers that be who work so hard preventing people from having the awareness and the tools to make a rational response. And we already know what their motives are, to a great extent… power and control. France has been third only to the FedGov and UK in attacking Islamic nations and communities in the “war on terror” (the war to cause MORE terrorism? ), so the attack makes a very perverted form of sense. It is wrong to mourn the 10 children dead in Nice and NOT mourn the hundreds of children killed each year by western air attacks in Syria and a half-dozen other places in the Ummah. France may have some minuscule amounts of guts that hasn’t been bred out or bled out of their people, however. The mayor of Calais finally announced yesterday that the tens of thousands of Muslim “refugee” squatters which have turned his city into a pit resembling a third-world barrio or ghetto are going to be driven away, to “someplace.” Soon. Not immediately. Give them another century and they MIGHT find a bit more courage. Maybe: it has been almost 20 months since the Charlie Hebdo attack, and the streets and businesses of France are no more protected than they were then. And the mobs continue to scream and run with their hands in the air, and the cops continue to be late and, frankly, poor shots. And I have to agree with a number of people; this is coming to the Fifty States. Are WE prepared? Although the American equal of the Charlie Hebdo attack, an attack on a cartoon contest in Texas, was prevented, the equivalent of the stadium/music attacks in Paris was the Orlando attack. Picture a semi or van-truck going through the crowds streaming into the stadium for a World’s Series game… Or the line of people waiting for the next Star Wars movie? Or whatever it is that they do with the crowds in the Folsom Street Fair in San Francisco? It is coming. And while I’d like to think that we could be better prepared to stop or prevent it, by voluntary public action, here than in France, I don’t think we are. Mama’s Note: Seems to me that the most intelligent thing to do, under the circumstances, is to stay away from these crowds altogether. There is not much of a way for an armed individual to protect themselves or their families from a bomb or a vehicle used as a battering ram… no matter how many new “laws” and prohibitions are issued, of course. This entry was posted in Commentary on the News, Nathan's Rants and tagged France, Nice, Self defense, Terrorism. Bookmark the permalink. The us is a relatively new country, it must be the reason i assume that ww1 and ww2 are a big thing for you, its understandable. But France is much, much older, and if you look at that its “sick track record”, it includes a tiny bit more, than, let say two world wars. Dear “Someguy” – thanks for commenting on this post from more than two years ago. I do not think it is so much that WW1 and WW2 are “a big thing” for Americans as it is that the entire 20th Century was NOT a good century for anyone. A bad century for more than Americans and French people, and largely due to government. Yes, France is a much older nation, and its resistance to Roman aggression, and later to English aggression, has much to commend it, and is filled with tales of heroes. As is indeed the case in the 19th and 20th Centuries: many brave and effective individuals have fought (and died) for their freedom and that of others. You are correct that the French track records is much more than what some people consider just two phases of a global war that perhaps still continues today. And I certainly do not think that the track record of the American FedGov is anything to brag about. If you notice, it is not just the French record in the Great War and the 1939-1945 war that I discussed: the record in the Franco-Prussian War, the Indochina phase of the Great Pacific War (1941-1954), and the Algerian affair also were addressed. But something happened to France during the Revolution and the Napoleonic era, when the love of liberty was corrupted into something truly dark and evil. And at the same time, France was sadly seemingly bled dry of those who loved liberty and were willing to fight for freedom and home and family. France has no shortage of individuals who are lovers of liberty and heroic: I’ve been privileged to know a few both in Europe and who visited Stateside. But France has become the epitome of the State – progressive and transnational both. French reaction to the recent terror attacks and the invasion of France itself by Islamists is something which I think we can both agree to not be a good example to anyone. Again, thank you so much for the comment. Please feel free to comment further and respond! What i meant in a nutshell was you cherrypicked examples of military catastrophes and drew the conclusion that france has a sick military record, which is a common american trope. When in reality, france has a military track record which is one of the best in europe, if not the best in its 1500 years of existence as a political entity. This is indeed 2 years old, i happened to come across it, and felt the need to correct some things in your article which were untrue. To me this obession with the individual and liberty is something american in nature from the enlightenment, the difference with france is that france is not by definition the republic, france existed before the revolution and should rightfully abandon this system of government. I certainly did not intend to cherry-pick examples, and I don’t think I did so. I agree that France as a “nation” has existed for a very long time – about four times the length of time that Anglo-American society has existed in North America. But although there has been “France,” the France of 2018 is much different from the France of 1918 or 1812 or 1786 or 1380, and so on. Even the French Republic of, say, 2018 is much different from that of 1918 or 1875. But I do not believe that history teaches that the “obsession with the individual and liberty” is unique to America: it was present in Spain in the early years after the Reconquista, in Israel during the time of the Judges, and even in the Americas at various times. I think it existed somewhat in France itself before the Jacobins won out and the cult of the state took over, when the fight was seemingly just between Bonapartists and the Bourbon supporters. And may have at other times, as well. I do not know as much of French history as I would like, and what I knew is tainted both from an Anglo-American and from a German perspective. I am curious as to why you believe a French republic to be an error. Because it tries to model itself as a utopia, much like the us, but its a grave error because It disregards very real differences between individuals and groups, negating the existence of ethnicity for one thing. It ignores the problems frictions between different peoples causes on its territory. The us and the french republic have obviously very similar foundations, and share the same ideals and principles, although the major differences are there is an ethnic consciousness in France from what i have been able to tell, because naturally there is a native french population, and like i stated earlier, France has no moral obligation to adhere to republican ideals, France doesnt owe its existence to them, and doesnt in my opinion represent the true character of its people, and in a sense a monarchy would be more natural for the french. The republic is bourgeois and ultimately universalist in its foundations, viewing the fact of being french as a matter of only citizenship, ignoring the havoc this wreaks on its society, facilitating its transformation into a multicultural, and also americanised one. It turns France into a patch of land where anyone can settle on, not required to integrate, much less assimilate. It values all people except the french people and threatens its existence, you just have to look at the demographics. I call it a false flag, France was talking about leaving the EU. Look at what happened in Paris last time: France had voted to approve Palestine as a state. Isn’t it funny… The government of France does all these things… do the people of France get to vote on whether or not to do them? Not a chance. Yet it is the ordinary people of France who are targeted for this mass murder and destruction. If those things were really important to the aggressors/terrorists, why do you suppose they don’t blow up government buildings and kill large numbers of government officials? That’s what I said. 🙂 If the “terrorists” were really interested in preventing more attacks on their people, they’d target the governments. As it is, they have demonstrated for a very long time that they really only want helpless victims. Unfortunately, the US government is pretty much the same.